Within the frame of the programme for innovation Disonancias, Ideazoka is Market of Ideas produced by Platoniq and the Department for Innovation and Entrepreneurship of the Faculty of Engineering at the University of Mondragon. Ideazoka wants to be a meeting point and a space for public participation where cooperatives and companies, students, researchers, workers, early retired people and citizens will contact echa other to create a map of opportunities and mutual collaborations. To design an "environment" where activities aimed at the developemt of creative, innovative and entrepreneurial abilities are encouraged in the short to medium term for engineering students, professors ans company professionals. Promoting the enterprising capabilities of students, professors and professionals by designing a unique framework for this was the starting point for Mondragon Goi Eskola Politeknikoa and the Platoniq collective, whose proposals converged in Ideiazoka, a market of ideas that hopes to lead to the creation of a local distribution and management cooperative of business ideas. Mondragon Goi Eskola Politeknikoa is a non-profit education cooperative and Platoniq is an international collective made up of cultural producers and software developers whose work generates innovative collective research tools and methodologies. The project developed by the two had to converge in the design of an environment that would favour the promotion of the innovative and enterprising capabilities of students, professors and professionals. 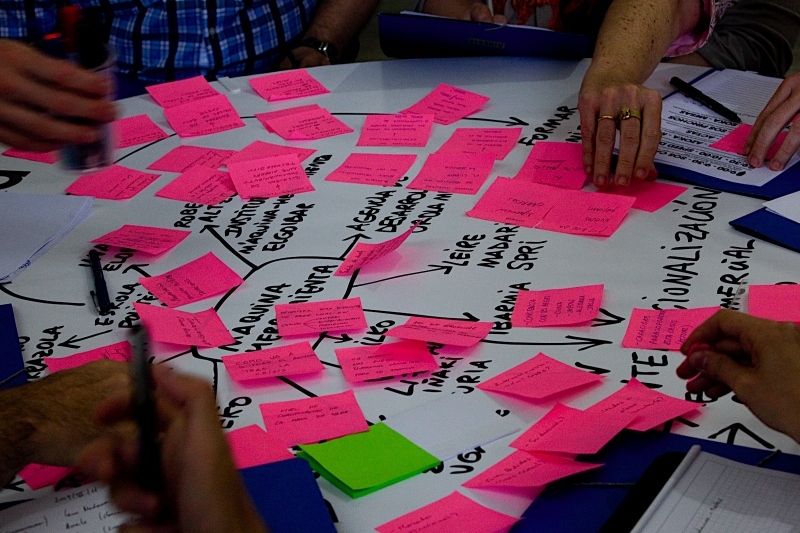 The team formed within the Disonancias framework had to connect with and provide possible solutions to the needs of some 20 organisations in the community of Urola Medio, doing this by using the potential of students and researchers from Mondragon Unibertsitatea and professionals from the participating entities. Platoniq wanted to work with the university by aiming to verify the possible potentialities of the cooperative model by taking into account the similarities this has with its own work methology, being as it is a pioneer in the production and distribution of copyleft culture. Consequently, this organisation -highlights of whose work includes the Bank of Common Knowledge- believes that in the genesis of the developed project beats an implicit desire: to reactivate the original mission of the cooperative model (to return to the source) and disseminate innovation in a step-by-step manner. Once the foundations had been laid, Platoniq claims that "perhaps the most complex thing was finding a way of working with the school, because it was not so accustomed to using tools such as the Internet, which facilitates the sharing of information and collaborative work". Part of the collective set up for a month and a half in Antzuola (Gipuzkoa), a town between Mondragón and Azkoitia, the nerve centres of the project. And there they developed an exhaustive field work, meeting with professors from the 18 lines of research in the school and then, in collaboration with Eskola's Innovation and Entrepreneurship team, choosing solutions from researchers, requests made by companies, ideas from students and challenges suggested by these pioneers for initiating this cooperative model. To do this, they visited faculties, cooperatives, companies, health clinics, elderly people's homes and farmers' unions: "We noticed that it was important to actually be there physically. Access to information in that work context flows through personal networks, by being there and the community". The research/action process materialised as Ideiazoka, a market of ideas that transcended the event in itself by becoming a tool for searching for ideas and local collaboration, bringing together solutions, problems, entities, people and technologies within the same region. The Jorge Oteiza pelota courts in Azkoitia was the place where Ideiazoka was celebrated on June 11th 2009, using the physical and symbolic space of the courts to express the concept of "rebounding idea". "It was about establishing a map of opportunities, facilitating contacts between diverse actors and providing possible solutions to the requests that were made by organisations and citizens". At the same time as the organisation of the event, Platoniq was also developing S.O.S, a computer application, a tool for bringing together people from the same area with common interests in order to share resources or collaborate in a new project. S.O.S helps to record audiovisual messages that are then classified and can be consulted on the Internet. When the system finds matches amongst the messages or responses to certain ads, it automatically sends an SMS to all interested parties, so they can set up a meeting. "It is an initial pilot experience to evaluate the potential of a local area by bringing together a university, technological centres, cooperatives and other companies, professionals, retired people... We want each participant in the project to rethink his or her relationship with the others", explains Platoniq. The methodology of this event, which is planned to be repeated in other local areas, not only inter-sectorially helps to creeate new products and companies, but also aims to include contributions from citizens by proving that "the proposals that are made show that innovation often does not require large budgets, but rather is bout bringing together those needing solutions with those who have answers". It is also hoped that Ideiazoka will lead to the creation of a local distribution and management cooperative for business ideas, moving from the solution of continous training to that of the continous connection of people, resources and opportunities, and promoting a social innovation movement. This text is a part of the catalogue "Disonancias 2008/09 Euskadi/Catalunya", published by Grupo Xabide in November of 2009 (ISBN 978-84-935693-3-4). You can download it here. Platoniq y la Escuela Politécnica Superior de Mondragon Unibertsitatea han puesto en marcha un proyecto innovador para fomentar ideas vinculadas al emprendizaje, que se llevó a cabo como experiencia piloto en la comarca de Urola Medio (Gipuzkoa) en el marco de Disonancias. Ideiazoka, el Mercado de Ideas que Rebotan, es una herramienta de búsqueda de ideas y colaboraciones locales que puedan desarrollarse en el futuro laboratorio de emprendizaje de Urola Medio.